Michiana Chronicles: Do You Hear What I Hear? Andrew asks if you hear what he hears? We have a lot of speakers in the theater. Not the lecturing, human kind (although we get our share of those, too). I’m talking about music speakers, the kind that are supposed to bathe an audience in glorious sound. Many of our speakers are hanging from the ceiling – for instance, we have a tall stack hanging on each side of the stage like a giant fold-out credit card holder. Other speakers, the big subwoofers, are sitting on the floor. And, of course, each box has multiple cones and horns wired up within it. It’s quite the system. By the time you count up all the tweeters, woofers and whatnot, we’ve got hundreds of sound contraptions buzzing and woofing at the same time. Like a room of unruly middle schoolers, these individuals can get really out of hand if left unattended for too long. This month it has all become too much. Everything has started to sound really funky – but not a good kind of funky. Like a harried substitute teacher, I’ve decided it’s time to take drastic action. I’m calling the principal. Or, in this case, I’m calling Raul. Raul is a national expert on concert sound systems. 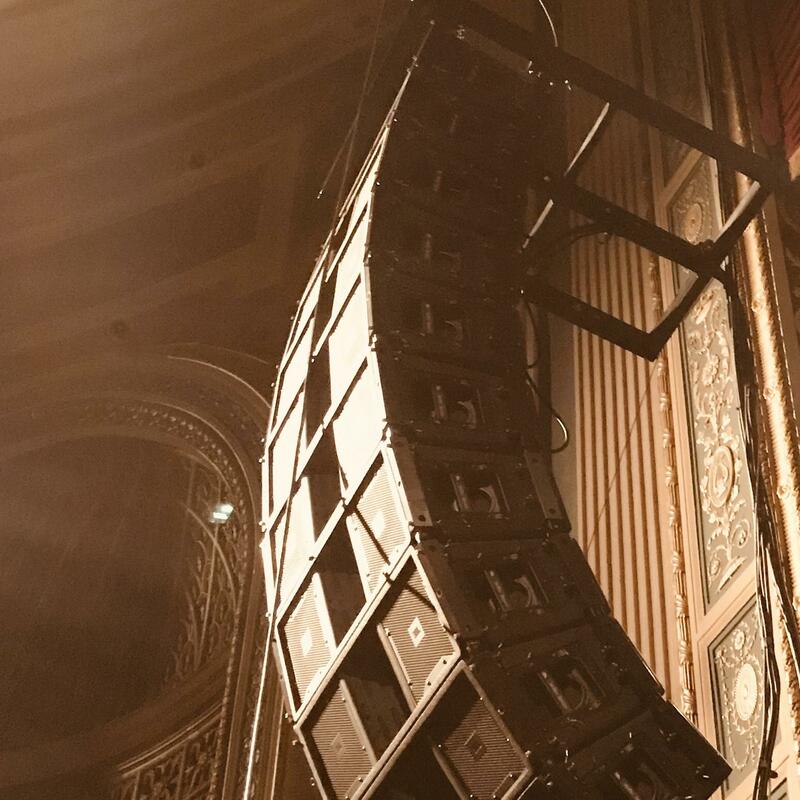 He works for Harman and JBL, and he goes around the country helping venues of all sizes “tune” their systems for optimal sound. Raul hits town at 11am on a Monday. Straight from South Bend Airport. He has taken the red-eye from Vegas – last night he finished setting up for the Foo Fighters, and he has 24 hours to spare – so he is squeezing me into his schedule. Putting down his backpack, he says – Do you guys have a coffee maker? And for the rest of the day, that’s all he asks for. I make coffee and he works. First things first, Raul walks into the theater, looks up at the speakers and asks: WHAT DID YOU DO? His voice is a combination of puzzlement, consternation and fascination. Over the years, we have made all sorts of changes to what we started with, and his face is a picture as he takes it all in. I feel like the slightly sheepish owner of a custom hot rod. The car has been repainted, it has different rims, the suspension is lower, and it runs on ethanol. But now I’m meeting with a master builder, and he’s looking at me like: This is nice, but it doesn’t drive straight any more. From his bag, Raul pulls a laser measure, and a fancy-looking spirit level. For the first half hour, he checks the exact dimensions of the room – bouncing a red dot all over the walls and ceiling. Then he asks my assistant Deen to get the genie lift. Deen goes up in the lift with the level, and calls out the angles of all the speakers as they are currently hanging. All this data goes into Raul’s laptop. He shakes his head and walks to the center of the room to confirm what he’s calculated. We’ve got to rehang those speakers, he says. I go to the attic catwalk and loosen the wires holding the speakers in place. Once each side is free, I fire up the two one-ton motors on the catwalk, and lower the speakers to the ground. Down below, they detach the speakers from each other and reposition them according to the angles Raul calls out. Ten, Two, Eight, Two, etc. Task completed, I raise the speaker arrays back into the air. They look different now – less of a stack, more of a banana shape – curled up at the top and down at the bottom in order to hit all the seats in the house. Raul nods in approval. It’s two pm. Now he can go to work on the amplifiers. He hands Deen a microphone with a long cable. Systematically, they take sound measurements all over the main floor, and then also in the balcony. These measurements again go into the laptop. After a time, he attaches his laptop to our stack of seven amplifiers and begins tweaking each one in turn. A little more high frequency here, a little less mid-range there, some extra oomph in the bass. I’m struck at the way his technique is often to remove sound, rather than to add. He’s carving the soundscape so that every frequency can be heard. Little by little, a solid wall of sound takes on three dimensions. It’s like magic. By five pm, it’s time to play some music. We go back and forth between country, rock and good old fashioned acapella. We walk the room, listening intently. Bonnie Raitt sounds as good in the back row of the balcony as she sounds in the front row of the house. And when Home Free bust out the low bass vocals, the room starts to shake. It’s beautiful. Then just as quickly as he came, Raul is packing up. He’s got to get going – Vegas is waiting. Deen and I are left in the theater grinning at each other. It’s been a crazy day, but the hot rod is fixed, the kids are in their seats… and I’m not gonna touch anything for a long, long time! I’d forgotten what it’s like to look for your first apartment. It’s been a week of living in borrowed spaces. Days pounding the pavement, exploring possible neighborhoods. Nights poring over internet ads, contacting landlords, hopes raised and dashed over and over. But finally, she’s found the right place. And today is moving day.